It would seem that my little theatre fire is a much bigger attracion than mere puppet shows. Nearly every day I find someone wandering round outside the theatre taking photographs, or posing for “selfies” with the theatre as a background. Sometimes I pop out and ask if they need any help. Usually they just say that they have heard about the fire and are so sorry etc. What puzzles me is that they are people who have never been to the theatre, nor usually even heard of it. Just a few minutes ago there were a couple, late middle aged, wandering around outside the foyer, the man shooting off a series of photographs just through the widows of the foyer. There’s nothing to see except for piles of boxes and and cases which I’ve moved from backstage to store in the only clean area, the foyer, and then there’s a mass of cleaning equipment, a small stove, and me sat at my laptop – certainly nothing very photogenic and nothing suggesting a fire. In fact there is nothing at all of the fire damage which is visible from the outside. After they’d been there a few minutes and him still clicking away I could not resist going out to have a word. They had seen the notice at the gate that shows were cancelled due to fire restoration work so they’d come to have a look round. Had they ever been to the theatre? No. Had they any interest in puppetry? No. Were they local to the area? No, they were on holiday. Did they come here regularly? No, this was their first time. Beginning to see the light? Well I’ve got a new window. Work has actually begun. The first contractors came to the Harlequin Theatre today and did a fine job replacing the smashed plate glass window in the foyer. Actually they are the only ones who can do anything, everyone else is waiting for the Insurance Company recommended Cleaners to do their work – and they are still working out whether all the theatre seats will be removed and sent away for cleaning while they work on the walls and ceiling, or whether they can work from scaffolding over the seats. If the seats have to be removed for cleaning then the cleaner will need to have a rather large workshop. 118 seats take up quite a lot of room. I must be patient. Luckily with old age I find procrastinating much less of a chore. Posted on 20th September 2017 20th September 2017 Leave a comment on Beginning to see the light? Well I’ve got a new window. I would like to sincerely thank those 25 puppet and Punch friends who so very generously contributed to a crowd funding appeal kindly arranged by Tim Sykes, not initiated by me but gratefully accepted, which I understand raised more than £800 to help towards the losses resulting from the fire. Thank you so very much to you all for your kindness and very practical support. The money is doubly welcome now that I am having to accept that it is now almost certain that I will not be able to reopen until after Christmas. In normal times I never read my emails before lunch. In fact I usually don’t switch on my computer until I’ve finished the morning chores and done at least some physical work. If the theatre is running then I usually re-set the show the day before, straight after the audience have left. So then my morning usually starts by sweeping and mopping the auditorium, cleaning the toilets, emptying the waste bins and replenishing toilet rolls and paper towel dispensers. I then re-set for the magic tricks part of the show, and also re-set and check the cabaret puppets. I then check my answerphone for bookings and mark up the seating plan appropriately. This usually brings me to lunch time. After lunch I will switch on the laptop, but only on battery, and check for any email bookings. I deliberately avoid getting involved with any other emails and switch off. I then go backstage and check music and lights, change into stage clothes. Normally it is only after the show that I switch on the computer to answer emails, update websites and so forth. The reason I tell you this is because I know my addiction. Once I am on the computer I can happily waste the days away. There’s always someething to do, something to discover, something to experiment with. And once started I don’t stop, and nothing gets done in the real world – no cleaning, painting, re-stringing – nothing. But now, since the fire, with all the waiting and frustration and uncertainty it is very difficult to settle to do anything. There’s so much to do that it isn’t possible to know where to start, so I start all sorts of things, find something more important, and nothing gets completed. I have to switch on the computer in the morning because all correspondence with insurers and all the various contractors is all done via email, so I have to read and answer my emails, and then its much easier to stay on the computer all day rather than face the real world of soot and dirts and smells. But I’ll be disciplined tomorrow – I won’t switch on the computer until I’ve done all the things I planned to do three days ago and didn’t. 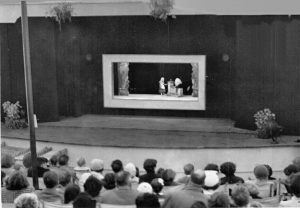 Before the Harlequin theatre was built in 1958 Eric Bramall usually had a seaside booking for the whole of the Summer Season, but during the rest of the year travelled with his mother performing in Variety and touring the very many Music & Arts Societies which were in most towns and villages throughout Britain. I mention this because I was reminded of those early days by a phone call. It was from a retired amateur puppeteer, Mal Trott, living in the Midlands who had read in “The Stage” newspaper of the Fire at the theatre and he was ringing to express his sympathy. He had visited the theatre once, in the early 90s but his memories of Eric Bramall went back to 1955 when he was living in Scarborough. Eric had performed there for week in small hall. Mal’s father was custodian of this hall and thus Mal, twelve years old at the time, watched every show during the week. This fired his interest in puppets which became a consuming interest for the rest of his life. 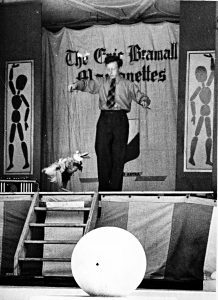 For those who don’t know, Eric Bramall was my partner for 40 years. It was Eric who built the theatre and encouraged, inspired and enthused me throughout our collaboration until his death in 1996. Any skill I have with marionettes came from watching Eric but I will never be his equal. Thanks for your concern, but not much to report. There’s not a lot to report, I am still at the stage of trying to get surveys followed by estimates from all the various tradesmen. These are then submitted to the Loss Adjuster who then gives me the go-ahead to order the work done. We then have to agree dates when this can take place. At the moment I have the go ahead for the joiner, the glazier and the electrician but no dates have been set. The major work of cleaning walls, ceilings, floors, seating and curtains has still to be worked out, three contractors being involved. The October opening looks less certain! I have been very touched by those of you who have expressed distress, offered help, and sent donations. Mostly I have thanked you personally, and I am most grateful. I am so sorry about the children who have been deprived of their annual visit to the puppet theatre. I would like to say a special word of thanks to the Wilkinson family. I received your card today and am very grateful. I do not have your address so cannot write personally, but if you do read this then here’s a big THANK YOU. Posted on 2nd September 2017 2nd September 2017 Leave a comment on Thanks for your concern, but not much to report.